The Washington Nationals officially introduced Chien-Ming Wang yesterday. He had an interesting quote and here it is. " I would like to do my best to make a contribution to this teams tradition." What tradition would that be, whatever they do have it isn't good. In other former Yankee news, Hideki Matsui talked to the press from Angels camp and said this " To be honest my knees aren't 100 percent." It looks like Brian Cashman and the Yankees made a good move here. Brian Cashman said in an interview with Nomaas that the reason he chose Marcus Thames and Randy Winn over Reed Johnson was that his 4th outfielder should have a history of playing full seasons. CC Sabathia will be throwing a bullpen today for the first time. I will have some news and notes from Yankees and Mets camp later on today. I know you are all thinking what is going on here with the basketball but I am getting a little help from a friend. I will reveal that information soon enough but for now I am going to be posting some basketball stuff for you NBA fans out there and to bring something else to the blog, to digress a little from baseball but of course I will continue to have daily coverage of the Mets and Yankees do don't worry for those not interested in basketball. Here is the recap of the New Jersey Nets week. The great news for the Nets was that they won a game this week. They also lost a game but who cares. They beat the Charlotte Bobcats on Tuesday night by the score of 104-93. It was the second time this season they have beaten Charlotte. It is pretty amazing considering they are 5-49 on the season. Courtney Lee was the high scorer for the Nets with 21 points. Brook Lopez scored 16 points before fouling out. Everything was back to normal again the next night when the Nets returned to their losing ways. Miami handed them a 87-84 loss at the Meadowlands. Dwayne Wade was injured in the first quarter and did not return to the game. Despite his absence the Nets were not able to take advantage. New Jersey had a 80-74 lead with 5 minutes left but Miami finished with a 13-4 run to close out the game. The Nets are now 5-49 and a embarrassing 29 1/2 games out of first place in the division. They are 22 games out of a playoff spot and what can you say except there is always the lottery and next season. This past week the Knicks played a home and home series with the Bulls and lost both games. Their record falls to 19-34 on the season and they are 7 1/2 games out of the playoffs. They only have 29 games left to play, they have lost 10 of their last 14 and the season seems to be slipping away. The first game against the Bulls on Tuesday saw the Bulls crush the Knicks by the score of 118-85. Derrick Rose proved to be too much to handle as he scored a game high 29 points. The Bulls were leading by 14 at the half and pulled away in the third quarter by taking a commanding 95-68 lead. David Lee led the way for the Knicks with 24 points and 12 rebounds. The Knicks didn't fare much better on Wednesday night at the Garden. They blew a 15 point lead to lose once again to the Bulls. They lost 115-109, this extended their losing streak to 5 games. Rose led the bulls again with 27 points and All Harrington led the Knicks with 27 points. The Knicks were without Nate Robinson who was traded to the Celtics for Eddie House. Jerry Manuel met with reporters this afternoon for the first time this season. He mentioned that he would like to bat Jose Reyes third. I don't know about anyone else but I don't think this is a good idea. He is a good leadoff hitter that sparks the lineup. I think if you hit him third he may change his approach and it wouldn't be for the better, he would try to hit more homeruns in my opinion plus you take away his stealing game. I think you have to keep him as the leadoff hitter. To Reyes credit he said it doesn't matter to him, he just wants to be playing and helping his team win games. He said that Jerry Manuel just mentioned it yesterday and even if he does it, it will only be until Carlos Beltran returns. He said he is the boss so whatever he decides he will go along with it. Jerry said that Jon Niese can be the fifth starter if he pitches the way he did last summer. He said Daniel Murphy is the starting first baseman, I assumed that but now it is confirmed. He wants a power bat off the bench like the Phillies had with Matt Stairs even if the player isn't able to play multiple positions like Mike Jacobs. Henry Blanco is the backup catcher and Alex Cora is the backup shortstop. You can see a video of Jerry Manuels press conference at http://metsblog.com/category/video Adam Rubin of the New York Daily News spoke with Kelvim Escobar who expressed little concern about being ready for opening day and the rigors of pitching everyday out of the bullpen. Joba Chamberlain and Phil Hughes spoke to the media toay and you can hear about 3 minutes from each on the Lohud Yankees Blog. Here is the link http://yankees.lhblogs.com Andy Pettitte followed the lead of the other starting pitchers and stayed off the mound, he will wait a few days before he revs it up. Here is what he had to say "My bodys feeling good, everything feels good coming into the spring. I feel real good about that." Andy also said the workload of the playoffs shouldn't bother him because the Yankees did a good job at the end of the year of resting their pitchers for the playoffs. He also said he is happy they added another reliable arm and that they never had met before but have already played golf together. Joe Girardi said you would love to have 2 lefties in a perfect world but they feel their righties get lefties out well. He specifically mentioned Dave Robertson but did say that 2 lefties gives you so many more options. Yogi Berra was in the clubhouse this morning according to Chad Jennings of the Journal News. Greg Golson and David Winfree both stopped in the clubhouse today, they are both going to be fighting for a job. It will be interesting to see what happens with guys like this, do they serve as trade bait, the last spot on the bench or go to the minors and add depth. Joe Girardi said the thing that has jumped out at him this early in camp was a lot of quality arms. He said some of the pitchers are big and intimidating, that he needs a step stool to talk to them. Here are the pitchers who threw today Joba Chamberlain, Christian Garcia, Phil Hughes and Edwar Ramirez. The second group was Kei Igawa, Mark Melancon, Boone Logan and Mosely. The third group was Zach McAllister, Ivan Nova and Kevin Whelan. The last group was Jeremy Bleich, Hector Noesi, Wilken De La Rosa and Mitchell. There isn't too much going on but I am going to try and post some pictures over the weekend and the starters are going to start throwing bullpens and then on Wednesday the full squad reports so it will get more interesting. The Yankees world is pretty quiet these days. Last year it was all about A-rod and his admission of steroids, this year they are world champions and there is just nothing crazy going on right now. This is New York and this is the Yankees so things can change quickly but for right now it is camp quiet and everything is good in the world. Here are some final notes from Yankees camp today. Some of the outfielders filtered in to the clubhouse today to drop their bags off in preperation for next week when they will all report to camp. Randy Winn was there along with Nick Swisher, Brett Gardner and Curtis Granderson. Joe Girardi said that Winn has a lot of experience and is used to being an everyday player. He will be competing for playing time in the corners Girardi said. The Yankees haven't decided if they will keep both Hughes and Chamberlain on the same schedule to line them up for the 5th starter or break them up, we will see how that all shakes out. There are no major injuries and no visa problems right now which is a good thing. Joe Girardi said anywhere between 100-120 games played for Jorge Posada would be good. He is talking about him catching that amount of games. 1,528 fans were in attendance to watch the Yankees first workout at George M. Steinbrenner Field. This was announced by the Yankees. The New York Mets seem to be quiet a chatty bunch early on. Johan Santana met with the media today and when asked who the best pitcher in the NL East is he said Johan Santana. You have to remember that Roy Halladay is in the NL East now also. He also said that he expects the Mets to win the World Series just like David Wright had said yesterday. The Mets are coming off a terrible year which was preceded by 2 epic collapses to miss the playoffs. I wonder if this is a new attitude because of all the losing, they decided to be cocky and arrogant and maybe it will rub off on everyone. They have to remember the best way to get people to forget about the dissappointments is to win. They just have to get on the field and win ballgames and then no one will care about anything else. Johan Santana said that he spoke to Oliver Perez who is mentally prepared this year, he said he didn't have that last year. That is a big problem, to me this is your livlihood shouldn't you always be mentally prepared?? The Daily News has a video of Oliver Perez throwing a bullpen. Jose Reyes did a interview with Kevin Kernan of the New York Post. He said that he doesn't want to go anywhere and isn't thinking about his contract. He will earn 9 million this season and the Mets have a 11 million dollar option for next season. He said right now he just wants to go out on the field and do his job to help the team win. He said he wants to finish his career as a Met. Reyes is a huge key for the Mets this season, when he goes the team goes, he has to stay healthy and tone it down a little bit and produce. It looks like he will take on more of a leadership role this season which the team really needs. The New York Yankees completed their first official workout for pitchers and catchers today. It was a quiet day down in Tampa. The only news was that Joe Girardi has decided to lighten the workload of his starting pitchers. This is mainly because they won the World Series and ended it in November which made for a shorter offseason then usual. Joe Girardi said they figured they could ease guys back into it, make sure that they are physically ready for the same type of workload. They have two weeks before they start to play games. Alfredo Aceves, Chad Guadin and Sergio Mitre threw the first bullpen sessions of the spring, they are all competing for the 5th starter spot and bullpen roles. CC Sabathia won't throw his first bullpen until Saturday and he will be in line to start the spring opener on March 3rd followed in order by A.J. Burnett, Andy Pettitte and Javier Vazquez. Joe Girardi said they will take Posada along slowly although he is feeling good and ready to go. Girardi said ideally he wants him to catch 110-120 games and DH some of the rest. Jorge Posada said whatever days off they want to give him he is fine with it. Bryan Hoch the Yankees beat writer for http://mlb.com said that Joe Girardi talked briefly to the players today. The media wasn't allowed in, he basically said to take it easy, they have 2 weeks before games and stressed communication. He said if you feel anything physically tell the coaches. He stressed I would rather have you miss a couple of days now then a few weeks or months later. There really isn't any other news coming out of Tampa from today, if there is anything later I will be sure to post it but it was a quiet first official day in camp. Jon albaladejo who has made the opening day roster the last 2 seasons has shed 30 pounds. Phil Hughes will be working on his changeup much like last season when he was working on his cutter. He said he will work on it all spring long. He stated he wants to throw another bullpen before he starts mixing in his curveball and cutter. Mark Melancon got married over the winter and Jason Hirsh celebrated the birth of his baby. Chad Jennings of the Journal News and http://lohudyankeesblogs.com stated he considers Hirsh to be a sleeper, we will see. He is a guy who was highly touted a few years ago but hasn't lived up to his hype, he actually pitched pretty well in the minors when the Yankees aquired him last season. Jorge Posada admitted to watching the World Series DVD over the winter. He said " I watched it and you can't believe it, it was a lot of fun." This is all the blogging I will do for today but check back tomorrow for full coverage of the first workouts and also the New York Mets reporting down in Port St. Lucie. It is going to be a wild and crazy ride all season long so keep coming back and please participate by commenting and lets have some good discussions. Today is the day that pitchers and catchers report, it is more of a formality then anything else. It brings a sense of joy and spring, as it continues to be cold and snowy in the northeast at least you can look to the fields in Florida and Arizona and think of the upcoming season and know that spring is near. Tomorrow will be the first official workouts and today is a pretty quiet day but there were some quotes and for the Yankees Joe Girardi did meet with the media at noon. Here are some quotes and some of what the manager had to say courtesy of Chad Jennings of the Journal News and wondeful Lohud Yankees Blog. Phil Hughes had this to say regarding any change in the clubhouse because the Yankees are the champs for the first time in 9 years. " I don't think it will, last year was nice but we need to do it again. At the end of 2010, I don't think anyone will be thinking about who won it in 2009." This is the Yankees way and it is so ingrained in them that I wouldn't worry at all about complacency, plus they have enough new faces that didn't win it last year. I think once the Yankees are on top they want to stay there and the whole organization gets more and more hungry. Here is what Joe Girardi had to say. " The expectation here is the same every year. In a sense you are supposed to repeat every year. I don't really consiser complacency to be an issue because I know the people in the room." I agree with that, you are supposed to win every year as a Yankee and that is a hard thing to do but once they do it and know how to win I think they want it more and more. Here is some more highlights of his press conference: He said the # 1 concern in his mind is ironing out the lineup. He said it isn't that I am worried about it because I know guys can do the job but it is where do they all fit in the lineup. He said there is competition on the pitching staff but he will make it clear that it doesn't start right away. He said his message will be look we are just getting ready now. I think what he is trying to say here is not to go all out and hurt yourself trying to impress the coaches. There is enough time for the competition but lets start out slow and get ready. Girardi said that he feels comfortable with either Granderson or Gardner in center field and they will both play there and left field in the spring. He said it isn't necessarily who is better as an individual but what combo works the best that will decide left and center. He said he envisions the loser of the 5th starter battle going to the bullpen. He would like to have that spot determined by March 25th but that isn't set in stone. He also stressed it isn't all about spring statistics. He said that they are going to do another group outing the day before the first game. He said he has heard suggestions of paintball and bowling. Those ideas made him a little uneasy as he doesn't want to do anything that he feels guys can get hurt at. He said they will continue to talk about it and will decide eventually on doing something. He said he doesn't want anything that involves running through woods or swinging heavy objects. The New York Mets had some news coming out of florida today. According to the Star Ledger of NJ Brian Costa who talked to GM Omar Minaya today he said that Henry Blanco would be the backup and the starters job would come down to either Josh Thole or Omir Santos. The 23 year old Thole hit 321 with 3 extra base hits in 17 games for the Mets last season. It looks like they were impressed with how he handled the pitchers. I think the best thing for him would be to go down to AAA and get some more seasoning in before coming up to the majors later on in the year but with this being the Mets who knows what they will do. Jose Reyes had a informal workout today and there is some video of him on Matt Cerrone http://metsblog.com/. 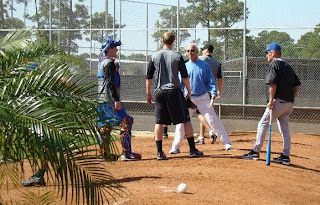 He was at tradition field where he did agility drills, jogging, batting practice and fielded ground balls. He said this " I have been doing so much of my rehab without the team, but now to be back with my team is really exciting. I feel like a little kid bro." He said that he has nothing to be afraid of that " I am able to do everything that I want to do." Mike Jacobs and Daniel Murphy worked together fielding ground balls at first base. Mike Jacobs also took batting practice in front of hitting coach Howard Johnson. The New York Yankees added 5 more players to their list of non roster invitees to spring training. The players are infielders Brandon Laird and Jorge Vazquez along with right handed pitchers D.J. Mitchell, Dustin Moseley and Ryan Pope. The Yankees will now have 25 non roster players in camp and bring the total number up to 65. Laird is the younger brother of Tigers catcher Gerald Laird and led the Florida State Leauge in Rbi's last season with 75. He also batted 266 with 13 homeruns. Mitchell is only 22 years old and made his professional debut last season when he went 12-7 with a 2.63 era in 25 appearances in Class A Tampa and Charleston. He made 24 starts and had 124 strikeouts which was second among all yankees minor leaguers. He also was tied for second in wins and fourth in ERA. Moseley came from the Angels where he went 1-0 with a 4.30 era last season. He was on the disabled list in April with right forearm tightness and in August underwent arthroscopic surgery on his left hip. Pope was with Trenton all of last season and went 5-12 with a 4.78 era. He was selected in the third round of the 2007 draft by the Yankees. He is the only player to ever come out of Savannah College of Art and Design. Vazques is 27 years old and was a 10 year veteran of the Mexican League. He signed with the Yankees in December of 2008, he made his Double A Debut last season batting 329 with 13 homeruns and 56 rbi's in 57 games before missing the final 2 months with a left wrist sprain. This information was provided on Yankees.com. The Yankees are going to have a packed house once everyone reports to camp next week, it should be fun as they are coming off a World Championship. It will be interesting to see if any young guys make a name for themselves because with the Yankees the roster is pretty much set but you never know for future trades or at some point if they can help the club with injuries or ineffectiveness. Today marks the last day of the offseason. Who would of thought we would of made it to spring training and Johnny Damon still doesn't have a team although it appears he and the Tigers are getting closer. The New York Yankees will officially open up spring training tommorrow with pitchers and catchers reporting at 10:00AM, manager Joe Girardi will address the media at 12 Noon. It has changed from years past where all the players really have to do is call and say they are in the area, a lot of the players have been trickling in at the minor league complex since last week. Here are the last few notes from pre spring training and then tommorrow it will be full coverage all day everyday of the Yankees and Mets so please check back often for news and opinion. I hope you will all come here and start debates and talk about different aspects of the season. I am always open to suggestions and opinions and it doesn't matter if you agree with me or not. I can be reached through the comments here or email at gmarchesej@aol.com. I thank everyone for all the support and lets have a great season. The New York Mets don't report until Thursday. Chien-Ming Wang officially signed with the Washington Nationals today, he will have a press conference on Friday. Here are the pre-spring training workout notes from today. CC Sabathia talked to the media today and stated he has only thrown 2 bullpen sessions so far and he usually has thrown 5. He stated he isn't too worried about catching up. He will throw one tomorrow when he reports to camp. He also stated he does plan on taking his teammates to Orlando Magic games during spring training, he already has the tickets so whoever is up for it come see him and he is ready to go. He also talked about being hungry for more and recruiting Lebron James to come play for the New York Knicks. Brett Gardner took batting practice and looked good. Everyone is saying how scruffy he is looking, I can't wait to see him. Derek Jeter, Francisco Cervelli, Ramiro Pena and Curtis Granderson also took batting pratctice. Most of the coaching staff was in attendance. Dave Robertson, A.J. Burnett, CC Sabathia and Javier Vazquez did some throwing. It was a rather cool day in Florida with temps in the 40's and 50's still much better then being here in the snow though. The New York Mets got to work today ahead of the Thursday report day for pitchers and catchers. David Wright, Daniel Murphy, Mike Jacobs, John Maine, Jon Niese, Ryota Igarashi and Hisanori Takahashi. Sandy Koufax was a guest of new minor league field coordinator Terry Collins and Guy Conti. They both once worked for the Dodgers. Here are a couple of pictures from Port St. Lucie, these pictures are courtesy of the NY Daily News and Adam Rubins blog Surfing the Mets. There wasn't much news coming out of today down there but Omar Minaya did say there is competition between Mike Jacobs and Daniel Murphy for first base. I don't know how the Mets could not have Murphy win that job though since there isn't any other spot for him and they really have high hopes for him and have continued to support him. Several of the New York Yankees are down in Tampa for pre spring training workouts at the minor league complex. Curtis Granderson arrived today according to Mark Feinsand of the NY Daily News and he did some fly catching drills today in center with Brett Gardner. Rob Thomson the third base coach was the one running the drills. A. J. Burnett played catch today and Chad Gaudin, Alfredo Aceves, Joba Chamberlain, Phil Hughes, Boone Logan and Dave Robertson were all spotted today. Curtis Granderson also got in live batting practice with Francisco Cervelli, Derek Jeter and Eduardo Nunez. He said he doesn't care if he is in center or left or where he bats in the lineup. He seems like a great guy and I am sure he is going to fit in just fine with this team. Joba Chamberlain and Phil Hughes threw bullpen sessions only a few yards away from each other side by side today which is pretty ironic since they will be battling for the 5th starter spots. The workouts will really get going at George M. Steinbrenner Field on Thursday with pitcher and catchers but on Wed they will all be reporting. Hang in there everyone as the long journey is about to begin, remember to keep checking back as I will have daily coverage of both the New York Yankees and New York Mets as they go through spring training and into the season. I am not going to go through all of the teams in baseball, I will do that before the season starts but I do want to look at the AL East teams briefly and where they stand opening up camps this week. New York Yankees: World Champions led by manager Joe Girardi who is in his third and final season under contract. Training Facility: Legends Field, Tampa, FL 2009 Record: 103-59 Key Additions: Javier Vazquez, Nick Johnson, Curtis Granderson,Randy Winn Key Losses: Johnny Damon, Hideki Matsui, Chien-Ming Wang,Melky Cabrera First Workouts: pitchers and catchers on Feb 18th, full squad on Feb 24th Boston Red Sox: lost in first round of playoffs last season after winning the Wild Card finishing second in the division. Led by manager Terry Francona who is in his 7th season with the team. Training Facility: City Of Palms Park, Fort Myers, FL 2009 Record: 95-67 Key Additions: Mike Cameron, John Lackey, Marco Scutaro, Adrian Beltre Key Losses: Jason Bay, Rocco Baldelli,Alex Gonzales First Workouts: pitchers and catchers on Feb 20th, full squad on Feb 24th Tampa Bay Rays: Missed the playoffs in 2009, finishing in third place. Led by manager Joe Maddon in his 5th season with the team. Training Facility: Mosaic Field at Charlotte Sports Park in Port Charlotte, FL 2009 Record: 84-78 Key Additions: Rafael Soriano, Kelly Shoppach, Dan Johnson Key Losses: Akinori Iwamura, Gabe Gross, Chad Bradford First Workouts: Pitchers and Catchers on Feb 19th, full squad on Feb 24th Toronto Blue Jays: Missed the playoffs in 2009, finished 4th in the division. They are led by Cito Gaston who is in his third season but remember he took them to back to back titles in the 1990's. Training Facility:Dunedin Stadium, Dunedin,FL 2009 Record: 75-87 Key Additions: John Buck, Alex Gonzalez,Kevin Gregg, Brandon Morrow Key Losses: Roy Halladay, Rod Barajas, Kevin Millar, Brandon League First Workouts: Pitchers and Catchers on Feb 22nd, full squad on Feb 26th Baltimore Orioles: missed the playoffs in 2009 finishing last in the division. They are led by manager Dave Trembley in his 4th season. Training Facility: Ed Smith Stadium, Sarasota, FL 2009 Record: 64-98 Key Additions: Miguel Tejada, Garrett Atkins, Kevin Millwood Key Losses: Melvin Mora, Danys Baez,Chris Ray First Workouts: Pitchers and Catchers on Feb 18th, full squad on Feb 23rd. The New York Yankees head athletic trainer Gene Monahan is taking a leave of absence. He will miss his first spring training in 47 years. He has a undisclosed illness and will miss all of spring training and the beginning of the season. The New York Post was the first to report this yesterday. He will remain in New York and receive extensive treatment over the next few weeks. Gene Monahan had this to say, " I miss being around my professional family already, but im battling." " The New York Yankees have gone above and beyond in this most difficult time. I couldn't do this alone, but with the support of my immediate family, my family within the organization, the dedication and expertise of many fine doctors I look forward to resuming my role with the team this season." Gene Monahan is the longest tenured head athletic trainer in the major leagues. He has worked in that capacity for the last 38 years. He was honored with an induction into the New York State Athletic Trainers Hall Of Fame in 2007. He received the distinguished athletic trainer award from the National Athletic Trainers association in 2009. Steve Donahue who has worked with Gene Monahan for the past 25 yrs as a trainer will replace him in his time of absence. The Yankees will have someone assist him but are not sure who yet.